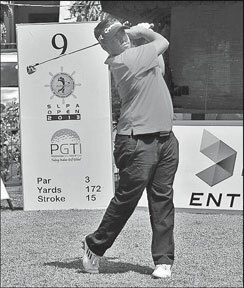 The ‘Sri Lanka Ports Authority Open 2013’ golf tournament was held last week. The Sri Lanka Ports Authority was the title sponsor while Dialog Enterprise was the gold sponsor of the event. “The SLPA Open 2013, was held at the Royal Colombo Golf Club with a a record number of participants and the biggest prize money of $ 70,000 for a golf tournament in Sri Lanka,” a spokesman for the company said. Dialog Enterprise will sponsor two of the top golfers in Sri Lanka, Mithun Perera and K Prabagaran at all local and international level golf tournaments in 2013. “Professional golf is still at a nascent stage in Sri Lanka although we have professional players who can represent the country internationally. Dialog Enterprise believes that our support and commitment will assist these players to take Sri Lanka to the next level,” said Chief Officer, Dialog Enterprise, Jeremy Huxtable. “Golf is a prestigious game. I am lucky to have the support of Dialog. Their generous sponsorship will help me to take my game to another level. I thank the management of Dialog and Chandana Weerasinghe for their support,” said Mithun Perera. Dialog Enterprise is the corporate solutions arm of Dialog Axiata.